In a previous article (The Horrendous Safety Record of China’s Manufacturing Sector), I noted that safety-related audits were not really effective. 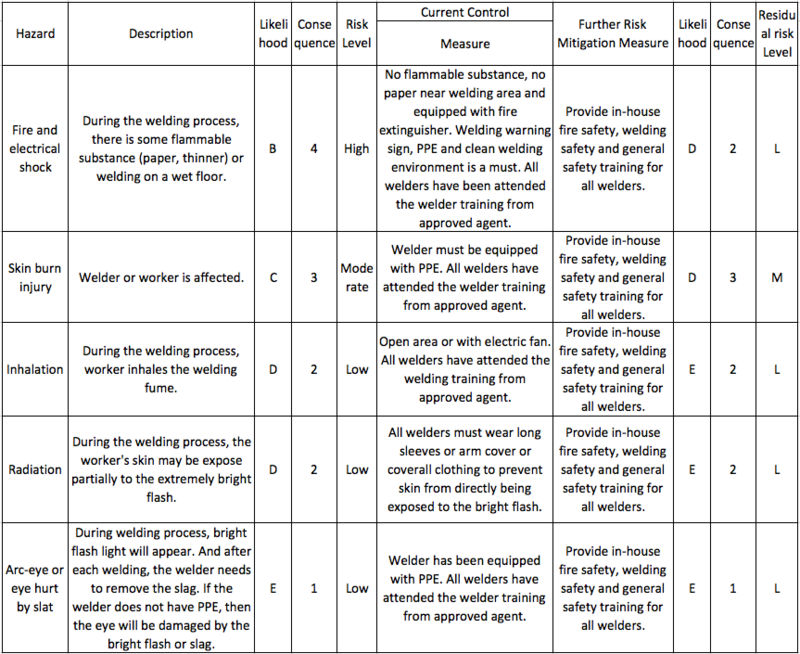 A more effective approach is to work with the manufacturers on a risk assessment approach. I thought it would be nice to show an example related to a common operation, arc welding. Who should conduct this assessment? Ideally, a group of people who know the process and have an understanding of safety risks. Not just one consultant or auditor on his own. The best is to start from a process flow chart and from past data about safety issues… but also to walk on the shop floor and observe the process. Once the main hazards are identified… it is time to work on improvements and then re-evaluate the risks (see the columns on the right of the table above). If you own the factory, you probably have some leverage — for example, include safety among the KPIs that impact people’s pay, and provide eye-opening training sessions. If you are trying to push your suppliers to improve, you have to find other ways. You can play with carrots and sticks too, and include a KPI about safety in your supplier management system. You will also need to provide them with awareness training. Managers know about the severe accidents that happened recently in their factory, but only a small minority of safety issues are reported. There are probably very serious hazards in their operations but they never think about them.